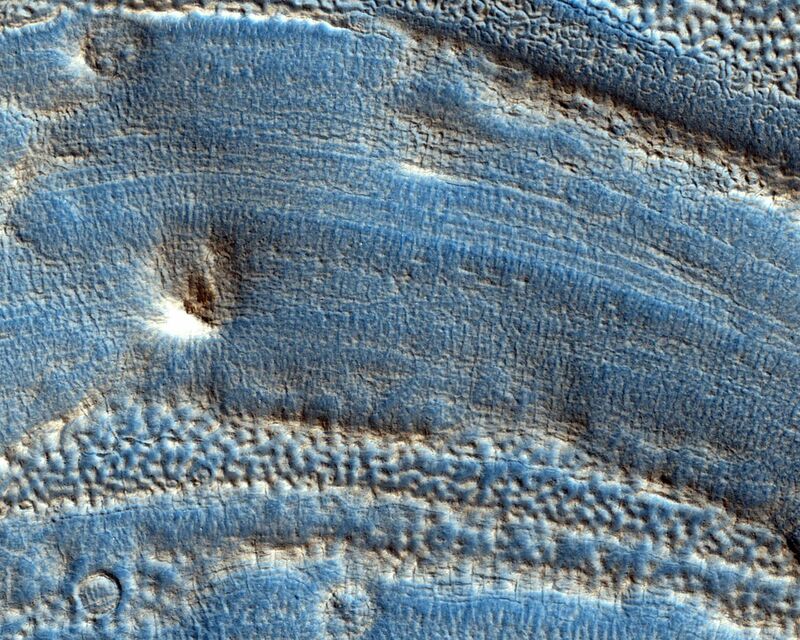 This image spans from wall to wall across the center area of an impact crater. 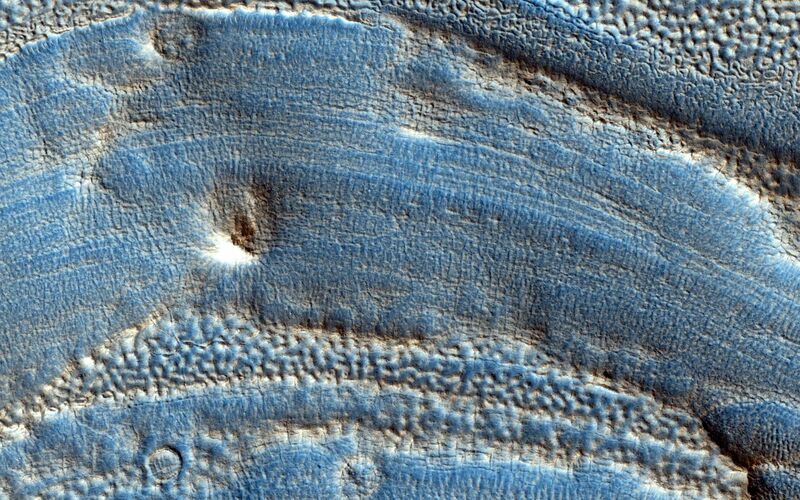 From what we see, a lot has happened to modify the appearance of the crater since it was formed, and this subsequent activity is the main interest of this observation. First, the crater is no longer deep and bowl like: it is shallow and generally flat across its interior, indicating it has been filled with material. The small-scale relief features of this filled surface give clues as to what has happened. The parallel wavy ridges suggest that the material was able to move and flow, perhaps in several successive stages, and likely due to the presence of ice in the ground. The fine scale pits and larger scale depressions suggest that more recently some of this ice may have disappeared by sublimating (changing from a solid directly to a gas) into the atmosphere, therefore deflating the surface. 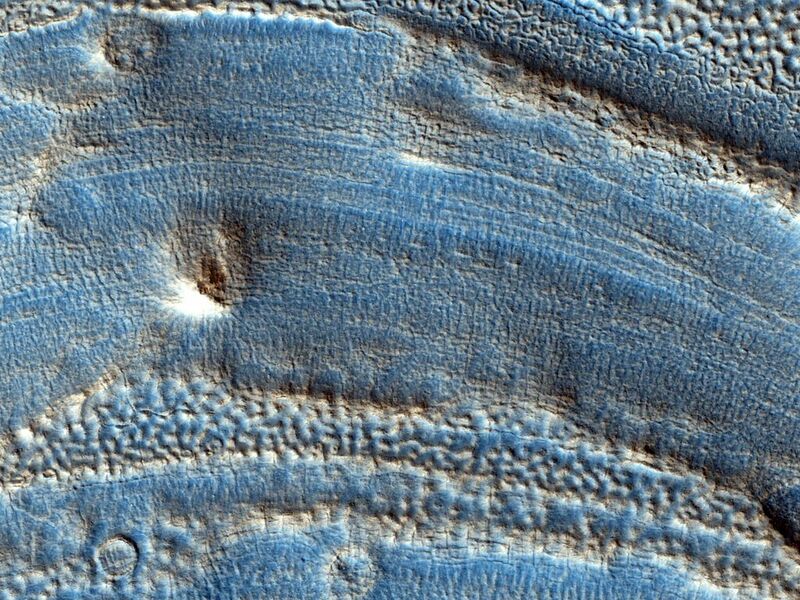 This story of deposition and loss of ice-rich material, possibly occurring over several cycles over the recent part of Mars' history (or longer, and possibly continuing today), is consistent with similar features in the broader region of the Utopia Basin. HiRISE is one of six instruments on NASA's Mars Reconnaissance Orbiter. The University of Arizona, Tucson, operates the orbiter's HiRISE camera, which was built by Ball Aerospace & Technologies Corp., Boulder, Colo. NASA's Jet Propulsion Laboratory, a division of the California Institute of Technology in Pasadena, manages the Mars Reconnaissance Orbiter Project for the NASA Science Mission Directorate, Washington.